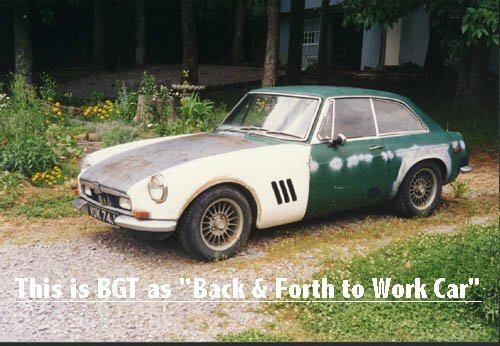 Many years ago, back in the hills of Tennessee my son had an MGB-GT which he put together with parts from his BGT, new and used parts he gathered. Just as Dolly had a coat of many colors, my son ended up with a car of many colors. Other than mag wheels and shorter stiffer front springs and fiberglass front fenders, it was stock. It was his transportation / auto cross car. A good set of tires, a little suspension work and his driving skill netted him many trophies. After he wore it out, he traded it to me for (I think it was a RD-400 Yamaha). I just did a ring and valve job on the MG and installed a overdrive transmission and used it to go back and forth to work with for another 5 years. When I went to retire the car, I didn't know what to do with it. It had a black primer hood, white fiberglass front fenders, a faded green body shell, a black seat on the drivers side and a tan seat on the passengers side, a 67 dash mounted to this 71 body shell and just about no carpeting. I couldn't sell it for much and it was too butchered to restore. But I still loved the car. The floorboards were rusted out and in need of a rocker panel and a rear fender patch panel. A friend and local Stockcar builder/driver (Who was tied with Darrell Waltrip for points up to the last race of the season just before Darrell went grand national) had built a 215 Olds and put it in an Isuzu PU. One day on the street he got his doors blown off by a little Chevy PU with a bigger than life engine in it. He offered the 215 to me at a "steal" (there's that word again). At about the same time my son found this "steal" on 4 Webers. I light bulb lit in my head. "I'll build my dream car". An MGBGT V-8 with 4 2brl downdraft Webers on it. Neeto! So I bought the 215 as it was being pulled from the Isuzu and bought the carbs. Now, all I have to do is put it together, no problem. Hmmm! going to need some body welding and I can't weld upside-down. So I designed and built a rotisserie for the car, so I could turn the car over to weld it and modify what was necessary to stuff the 215 in. I heard about a guy in Delaware that had been putting 215s in "Bs". So, I contacted him and found he had a lot of experience doing this. He even sent me a video of some of the work. This got me even more enthused. He used mainly the newer Rover 215 with a Rover 5 speed box. He said he tried the "B" box, and even though it was noted for holding up well with a "B" engine, it did not hold up well behind the Rover. He did have good luck with the Rover 5 speed. This is the same box as the TR-7 5 speed. I just happened to have two of them. The pictorial on the other Link #2 is in the order that I did the work. As you will notice, there was a lot of switching back and forth on the project. some of that was because I was held up on one item so I would proceed with another. Other times I just felt like working on one part because I dreaded doing another part. I did not keep track of the hours spent as I looked at this as my hobby and from my years as a mechanic I knew that I could never think about making money on this project. Like a guy I met once who built Kit cars. He told me that you could build a good Kit car for about $15,000. that would be worth all of $10,000. when you were finished. I think that will apply to this car although that price will be different. Here is a rough outline of the plan and changes in plans. 1. 215 w/4 Webbers on a weld together manifold, custom built radiator, w/"B" box w/overdrive, std. "B" rear end. 3. Remote water pump w/ reverse flow cooling, remote oil filter and cooler, double disk clutch, Mustang Posi rear end, engine mounted down and to the rear. 4. Starter system eliminated and an direct compressed air starting system installed. 5. Exhaust headers with 360 degree pipe system. 6. Exhaust headers with 8 reverse cone megaphones in pipe system. 7. 4 piston alloy front calipers with vented rotors and 2 piston disk rear brakes. I hope I get this thing finished before I decide on more changes. I have not decided on the ignition system yet, but I am leaning toward an electronic system that can adjust timing on each individual cylinder to the optimum at all times. Items that are presently complete. Click here to read details of Body Modifications 12/13/01 "Finished"
Front engine cover with oil pump modified to accept remote oil cooler/filter and water pump system eliminated. "Finished"
Fire wall cut away and remade further back. "Finished"
Motor mounts and transmission mounts in place. "Finished"
adapter plate complete, Engine to 5 spd box. "Finished"
Gearbox shift tower shortened to fit car. "Finished"
Sand cast manifolds and carb top plates w/ velocity stacks. "Finished"
Air valve and air distributor for starting system. "Finished"
Exhaust header flange plates, Cooling system flange plates. "Finished"
Front cross member modified to fit 215 front pulley. "Finished"
Steel for new floor pans cut to fit. 12/99 "Finished"
One new rocker panel installed 12/99 "Finished"
Frame modification for steering shaft clearance 12/99 "Finished"
Ford axle housing cut down with MG outer tubes added 3/00 "Finished"
Drivers seat (TR-7) cut to fit MG space. 3/00 "Finished"
Axle shafts are cut and resplined. 5/00 "Finished"
Torque arm completed and installed. 5/00 "Finished"
Headers fabricated from "U" bends and "45s". 6/01 "Finished"
Steering shaft with "U" joints. 6/01 "Finished"
Steering rack rebuilt. 9/01 "Finished"
Hood modifications, front hinges and air intake. 11/01 "Finished"
Front lower valance air intakes enlarged and wire screened for oil cooler. 12/01 "Finished"
Body and paint finished by body shop. 6/05 "Finished"
Flywheel cut down and indexed to take Mazda RX-7 Turbo pressure plate and both balanced separately. 11/05 "Finished"
Compressed air start system installed and tested 8/08 "Finished"
Steering wheel modified and mounted on shaft 10/08 "Finished"
Modified clutch, brake and throttle pedals installed 10/08 "Finished"
Front suspension components assembled 11/08 "Finished"
Engine cooling pipes installed on engine 11/08 "Finished"
Door vent windows installed 9/09 "Finished"
Right side door window installed 9/09 "Finished"
Engine and transmission bolted in. 10/09 "Finished"
Radiator mounts installed 10/09 "Finished"
Front bumper installed 10/09 "Finished"
Engine and transmission installed 2/10 "Finished"
Left Door glass installed 4/10 "Finished"
Door latches powder coated and installed. "Finished"
Fresh air box for cooler "Finished"
Instrument cluster and wood dash made and installed. "Finished"
Items that were completed before 215 project started. Front and rear fenders flared to accept mag wheels and wider tires. roll cage tubing "Not Installed"
On board air pump for air starter system and reserve air tank.